I’ve been looking at some recent and major water discoveries, here and elsewhere, and for me, they are all part of the same story. When we talk about life, we talk about water. Pockets of water ice on the southern pole of Mars. The fine dust of the Martian planet surface, gathered, cooked and analyzed by Curiosity, has revealed itself to be “acting like a bit of a sponge and absorbing water from the atmosphere,” according to Laurie Leshin. Leshin is the lead author of a study showing that surface soil on Mars appears to contain approximately 1 liter (2 pints) of water in every 0.03 cubic meter (1 cubic foot). The Sample Analysis at Mars instrument (SAM) aboard the spunky NASA rover, taken together with information from other robotic explorers previously sent to the planet, indicate that this soil is probably distributed across the planet in similar composition. But before you put on your space boots and prepare for lift-off, it should be noted that the soil also seems to contain a fair amount of toxic substances such as perchlorate as well, a challenge that would have be overcome before humans could consider any form of manned mission or colonization. 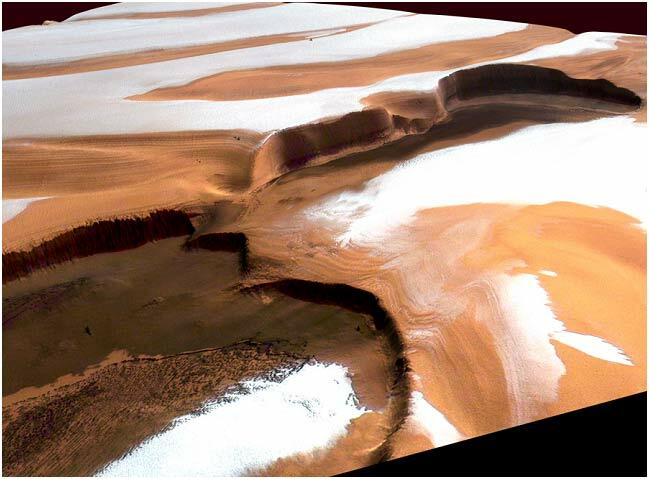 More on Martian water, from the ice caps to why there is no visible surface water, here. On a related note, to get an idea of what can live in one cubic foot on Earth, about one large shovelful of soil, it’s worth having a look at the fascinating A World in One Cubic Foot by David Liittschwager. Two deep underground aquifiers have been discovered beneath the Turkana and Lotikipi basins in northern Kenya using radar, satellite technology, and verified through UNESCO supported test drilling. Together, they are estimated to contain up to 250 billion cubic liters of water. The area, home to mainly nomadic people, has been subject to extreme water scarcity and drought, while Ethiopian dam projects on the other side of the border could potentially reduce the levels of Lake Turkana itself. “This newly found wealth of water opens a door to a more prosperous future for the people of Turkana and the nation as a whole. We must now work to further explore these resources responsibly and safeguard them for future generations,” Judi Wakhungu, cabinet secretary in the Kenyan ministry of environment, water and natural resources said at the start of a water security conference in Nairobi. 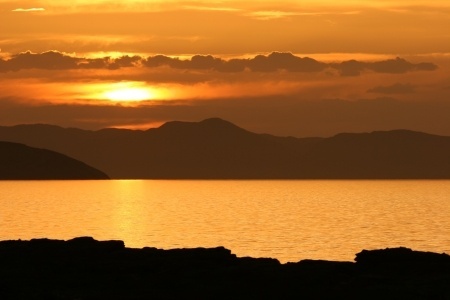 Lake Turkana is located in the Kenyan Rift Valley and is the largest desert and alkaline lake in the world. Large numbers of primate fossils have been found in the area, and the lake is widely regarded by anthropologists to be the origin of the human race. In other news, large oil reserves have been found in the same area. The water supply stress index (WaSSI) model considers regional trends in both water supply and demand. On the other side of the water discovery coin, there’s the United States, where most people might assume that access to clean, fresh water is a given in a country with a long history of water distribution. But according to a report by the Cooperative Institute for Research in Environmental Sciences (CIRES) at the University of Colorado-Boulder, one in ten watersheds in North America are ‘stressed’, i.e. “demands for freshwater sources outstrip natural supplies”. The pressure on watersheds is likely to increase with the impact of climate change, according to CIRES. “We hope research like this helps us understand challenges we might face in building a more resilient future,” said co-author James Meldrum.